Arsenal, who a few days earlier had beaten Spurs 2-0 in the North London derby, came into this match in 16th place whilst Swansea were just a spot behind in 17th, and both teams were greatly underperforming from the previous season. 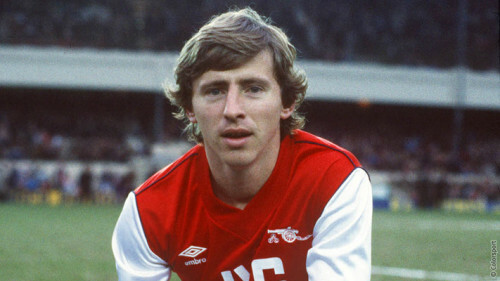 The main story of this game was that Vladimir Petrovic, the first big name foreign star to arrive at the Gunners, was making his delayed debut for Arsenal, but this game was not his first at Highbury. In December 1978 he played for Red Star Belgrade as they knocked Arsenal out of the UEFA Cup. In the second minute Alan Sunderland struck a speculative shot that bounced off Nigel Stevenson and into the net. 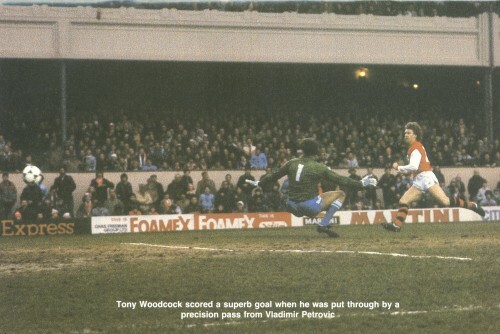 Four minutes later and Petrovic threaded a ball through to man of the match Tony Woodcock to finish with a fearsome shot past Dai Davies. Petrovic had set up the second goal to acclaim from all round Highbury, and as Arsenal had scored twice in the first six minutes it prompted Swansea manager John Toshack to say later he feared they were about to be hit for six. The match was being played in a swirling rain which made conditions heavy and difficult for all players involved, tending to nullify the early attacking promise. Swansea’s defence, after the initial double shock, tightened up considerably and Arsenal rarely looked like scoring again, despite Kenny Sansom’s marauding runs down the left, and the clever touches of Graham Rix and Sunderland. In the middle of the second half Ante Rajkovic headed on for Alan Curtis to shoot past Pat Jennings and halve the deficit. Soon afterwards Jennings produced a fine fingertip save while going backwards that kept out John Mahoney’s long shot. It was a save that belied his age especially as he had little else to do all game. Terry Neill was spoken to by the officials over his excessive touchline coaching, while the win pushed Arsenal up two places to 14th, with the Swans remaining firmly in trouble in 17th spot. 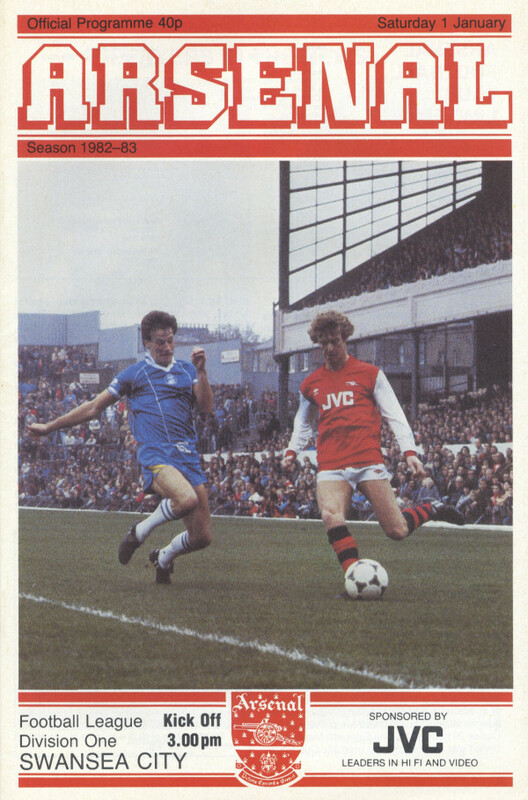 Arsenal: P Jennings, J Hollins, K Sansom, B Talbot, D O’Leary, S Robson, A Sunderland (substitute: L Chapman 84 minutes), V Petrovic, T Woodcock, P Davis, G Rix. Swansea: D Davies, W Evans, A Rajkovic, N Stevenson, D Lewis, N Robinson, J Mahoney, D Hadziabdic, L James, B Latchford, A Curtis (substitute: G Stanley 70 minutes). 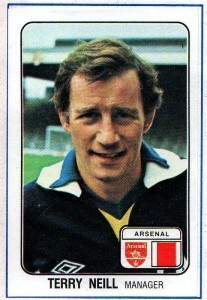 Terry Neill had tried to purchase Petrovic immediately after the 1982 World Cup, in which he played for Yugoslavia, and he initially joined Arsenal for the pre-season of the 1982-83 campaign, but was stopped by the Yugoslav football federation regulations barring players going aboard before the end of the calendar year, hence his arrival in January 1983 and not earlier in the season. However, Petrovic was only to last half a season at Arsenal playing 22 games and scoring three times. He appeared in the League Cup and FA Cup semi-finals but his silky skills could not help in finding a way to Wembley. A player ahead of his time, he left in the summer and joined Belgian club Royal Antwerp. 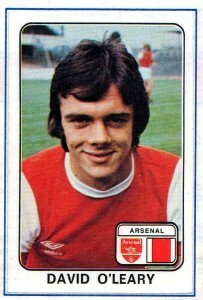 John Mahoney appeared for Stoke against Arsenal in both the 1971 FA Cup semi-final and replay. Arsenal finished in mid table at 10th after being in the lower reaches of the league for much of the season. Swansea ended in 21st position and, consequently, were relegated along with Manchester City and Brighton. This was Swansea’s second season in the English top flight. In the previous campaign Swansea had finished sixth, one place behind Arsenal, but performed so well that on five separate occasions they had topped the table. Arsenal reached the semi-finals of the FA Cup and League Cup but on both occasions were beaten by Manchester United. Swansea were knocked out in the 3rd round of the FA Cup by Norwich and the 3rd round of the League Cup by Brentford. Arsenal’s foray into the 1982-83 UEFA cup was something of a disaster as they lost 8-4 on aggregate to Spartak Moscow, including a 5-2 drubbing at Highbury. Despite being relegated Swansea qualified for next season’s European Cup-Winners’ Cup by virtue of their Welsh Cup win, though they were beaten in the preliminary round. Seven weeks after this game 37 year old Pat Jennings became the first player in English football to appear in 1,000 first team matches. He reached this milestone against West Bromwich Albion on 26 February 1983. Chelsea were reported to be interested in signing Charlie George at the start of 1983. The Daily Mirror reported that Chelsea felt the former Arsenal star would be a big crowd puller and was “the man to give their team a much needed personality boost…as well as improving their position in the Second Division”. However, nothing came of these rumours. 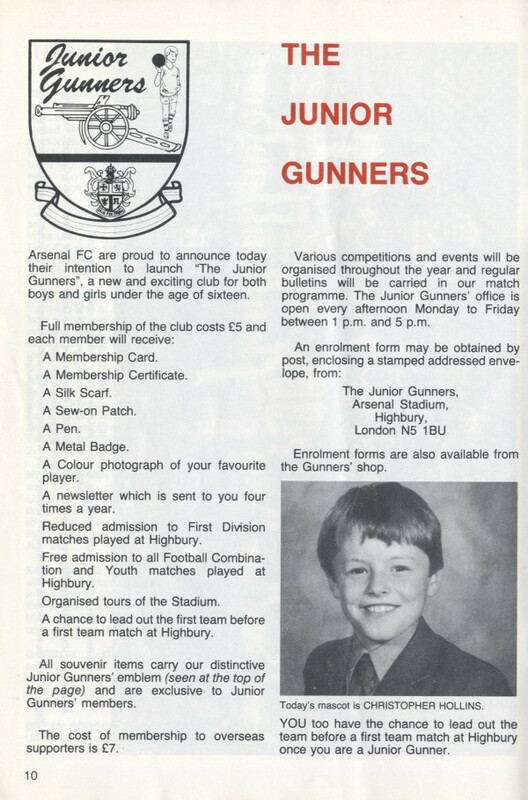 Towards the end of the season, the Junior Gunners was launched. John Hollins’ son Christopher became Arsenal’s first JG mascot for the home game against Manchester United. This season we’ve been asked to write a regular page in the official Arsenal programme based on a classic match featuring the opponents for each game we play in. 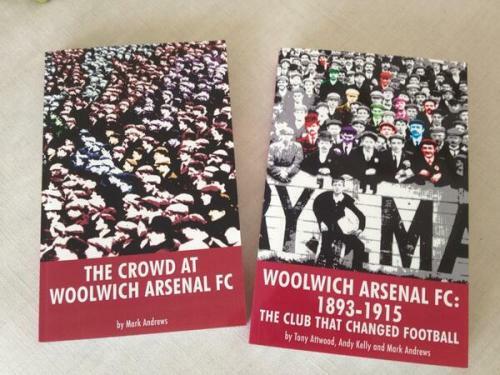 Programme editor Andy Exley has kindly given us permission to reproduce the match reports on our blog. We will also be including additional material that didn’t make the final edit of the programme. If you can’t get to The Emirates, the programme is available on iPad, iPod and android for a bargain 79 pence per issue.